God always knows where to find the people He is looking for! The man who was later to become a patriarch, Jacob, learned that in a spectacular fashion. Jacob had cheated his brother Esau out of his blessing, and was on the run from his angry twin. But Jacob could not flee from God. 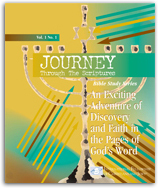 So as Jacob stopped to rest at a spot about twelve miles north of Jerusalem, he saw a vision of a ladder to heaven. This was amazing – but the most amazing thing is that despite Jacob’s deception, God promised him that his offspring would be like “the dust of the earth,” and would inhabit the very land on which he was sleeping. Jacob woke up and realized God had been in that place. Moved by fear and joy, Jacob built an altar and named the place Bethel, or “house of God.” God renewed His promise to give the land of Israel to Jacob and his descendants, and vowed to bring him back, even though Jacob would be gone for twenty long years. This event is critically important to the people of Israel and their history, for the Israeli people are the fulfillment of this dream God gave to Jacob! Why do you think God revealed Himself to Jacob in a dream? God identified Himself to Jacob as “the God of your father Abraham and the God of Isaac” (v. 13). Why did the Lord mention Jacob’s ancestors? Read Psalm 16:11 and describe at least two ways that God's presence can turn an ordinary place, or an ordinary day, into something special. God told Jacob He would not leave him until He fulfilled His promises. Does this mean that God left Jacob after the promises to him were fulfilled? Even when we are not at our best, God is faithful to reach out to us and restore our fellowship with Him. He can come to you no matter wherever you are on your journey. Jacob’s experience at Bethel is proof of this! Trust God to show you His will even when you are not expecting Him to act.